There isn’t a whole lot five hundred miles West of Austin. Once or twice on our journey a road runner would characteristically dash across the pavement, or even more theatrically, a tumble weed. 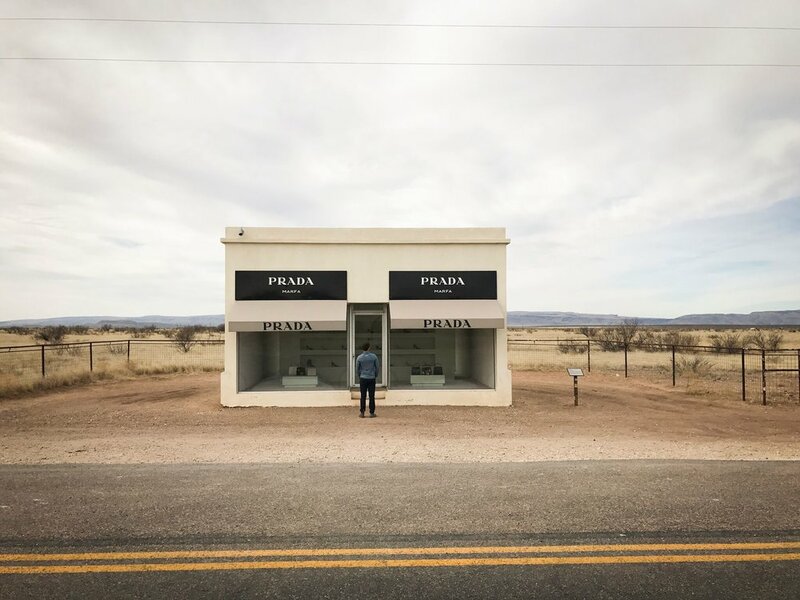 Our destination among the vast nothingness was Marfa, Texas —an island in an ocean of dessert. Much as the ocean is the Vineyard’s stoic gatekeeper, imposing forty five minutes of contemplation and observation in form of a ferry ride, the dessert creates a threshold of emptiness, impassible by any means other than a 3 hour drive during which both mind and landscape transform from busy and twisting to flat and open. The magic of this subtle barrier was heightened by our travel at dusk, casting flat blue light on the omnipresent creosote bush, and shrouding Marfa in the mystery of night. Once parked and exhausted we immediately went to bed. The next morning, eager to experience the new landscape I stepped outside for my morning coffee and was frozen in place by uncanny stillness. There was no wind, no sound except a distant croaking raven and nothing but dusty yellow grass stretching to the empty blue sky. As we wondered into town we saw Marfa is like the land surrounding it, empty. The train last stopped in town in the early 70s and Marfa never recovered. Every other building is boarded up, the single grocery store only has 5 isles, and the only place we tried to get a sandwich for lunch ran out of bread. Through this great lacking however, Marfa reveals herself. The constant presence of the void and awareness of emptiness creates a rarified atmosphere where even the most mundane encounter becomes charged with meaning. To put it simply, walking in Marfa is weird. We liked it. It was precisely this elusive quality that drew the artist Donald Judd to Marfa, where, in the early 90s he bought entire blocks of the town and the retired air force base. Before his death Judd transformed the base into a permanent installation space called the Chinati Foundation, for his minimalist sculptures, a pairing that couldn’t be more perfect. Judd’s sculptures resonate with the equally sparse landscape and each elevates the other. I’ve seen plenty of Judd sculptures before, but never felt them until visiting Marfa. This place was special. During the short stay a single topic dominated conversations with our friend Mary Etherington, who moved to Marfa after decades on the Vineyard. Was this what the island was once like a mix of cultured bohemians and like-minded one-percenters? Is this the time to invest in Marfa, and hope an explosive return on investment, like Chilmark real estate before the phone lines? Could Marfa help launch our art careers? The answer we discovered was no, this place, like many we’ve visited is a smaller reflection of America as a whole. Judd created a minimalist’s paradise in rural Texas, but in doing so also sowed the seeds of its undoing. Putting Marfa on the international art map set the wheels of gentrification in motion, each year more of the latino families who maintained the town between booms are forced out by living costs. The hip art-savy crowd who first migrated to Judd’s vision are priced out of rentals, as buildings are bought and turned into high-end Air B and Bs. Plus there’s talk of building a new airport, for the art collectors to fly into, who else is going to buy the $100,000 Christopher Wool paintings in the new hotel lobby? Here too, the river between rich and poor is widening. After 3 days that seemed strangely divorced from time we departed for New Mexico, back into the subtle barrier of the Texas flatlands. Traveling West, boarder patrol checkpoints are the single interrupters of the vast emptiness. Some are evident miles over the horizon by white blimps floating hauntingly in place, tethered to the ground by great kevlar leads. These eyes-in-the-sky spot any would be boarder crosser, and effortlessly dispatch a convoy of armed boarder agents to intercept before they ever cross the Rio Grande, another river ever widening.